Two-year-old Personal Ensign won her 7-furlong debut by a dazzling 12 3/4 lengths. Propelled into Grade 1 company next out, she gamely won the one-mile Frizette. Plans had been made to ship her to the 1986 Breeders’ Cup at Santa Anita when she suffered a severe injury to left rear pastern. Dr. Larry Bramlage performed surgery, inserting five surgical pins, and told the filly’s connections that she “had a chance” to make it. Personal Ensign recovered completely, and came back at three, after an 11-month layout to win two allowance races and the Rare Perfume in succession, then posted her second Grade 1 win in the Beldame S. against older mares. At four, she won the Shuvee and the Maskette (over Kentucky Derby winner Winning Colors) and dominated the Hempstead H., the Beldame S. and the Molly Pitcher H. Always a sportsman, owner Ogden Phipps decided to let her have a chance against males in the Grade 1 Whitney H. Personal Ensign rose to the occasion, winning by a determined 1 1/2 lengths. In one of the most dramatic races ever, Personal Ensign kept her perfect record intact when she overcame adversity and a stellar field to win the Breeders’ Cup Distaff by a nose at the wire. As a broodmare, the impact of Personal Ensign was immediate. Her first foal, Miner’s Mark (by Claiborne’s Mr. Prospector), won the Jockey Club Gold Cup. In addition, she produced other G1 SWs Traditionally, winner of the Oaklawn H., and the brilliant filly My Flag. By the Phipps/Claiborne stallion Easy Goer, My Flag won the Breeders’ Cup Juvenile Fillies as well as the Ashland S. and Gazelle. She herself is the dam of Breeders’ Cup Juvenile Fillies winner Storm Flag Flying and the granddam of GSW Parading. Personal Ensign is the dam of three other stakes horses: Salute, Proud and True and Our Emblem. The latter sired dual Classic winner War Emblem. 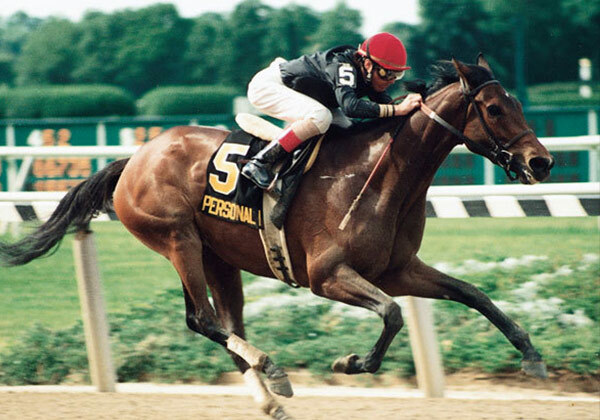 Personal Ensign was pensioned at Claiborne until her death from natural causes on April 10, 2010. She is buried at the farm.